Springtime is when the plants of Israel really shine, especially in Jerusalem. The recent blessings of rainfall have brought a surge of growth and lushness to our landscape. This unfolding spectacle holds new pleasure for me lately, thanks to my participation in a course about the healing plants of the Land of Israel. What used to seem just a blur of greenery over the sun-baked scenery surrounding my home has, this spring come into focus as each distinctive plant now has a name, a family and a host of healing and eating possibilities. 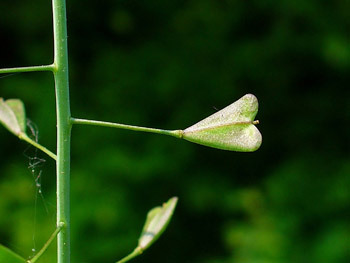 The seeds are used for spices and for garnishing your hot dog, but many people are unaware that the leaves are also a delicious and zingy addition to a green salad. 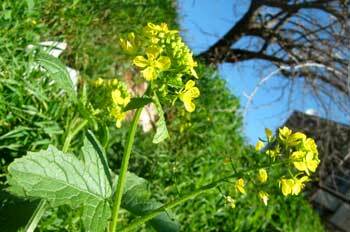 Moreover, both the leaves and seeds have traditionally been used as an anti-inflammatory, to relieve inflammation of the joints and ear infections, and against kidney stones. 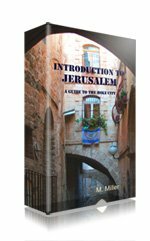 This, the work-horse of native Israeli herbage, grows freely throughout urban areas and is known for its culinary and medicinal versatility. It promotes healthy digestion and is an effective treatment for blisters and coughs. Mallow can be served in salads and soups or stuffed like cabbage. It also makes a snack on the run, when you find one growing in a crack in the pavement by the bus stop after skipping breakfast. 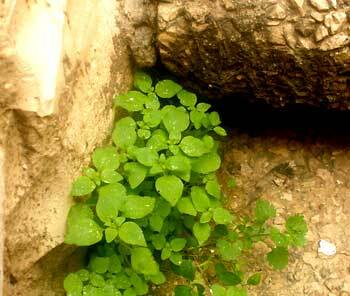 Mallow is so widespread and nutritious that it almost single-highhandedly sustained the residents of Jerusalem during the siege of 1948. 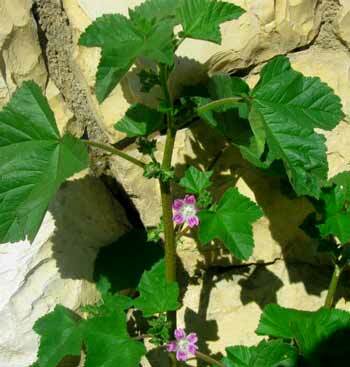 Nutritious mallow can be identified by its mauve flowers. In fact, the French name for mallow is the source of the word mauve. 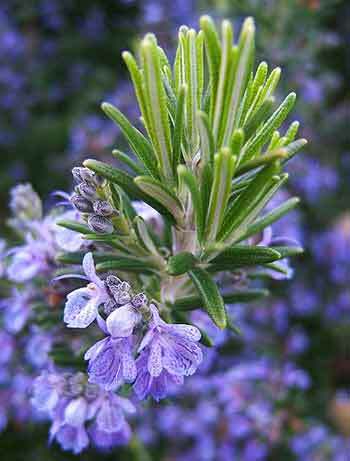 What would the municipal landscapers of Jerusalem do if God hadn't created rosemary? 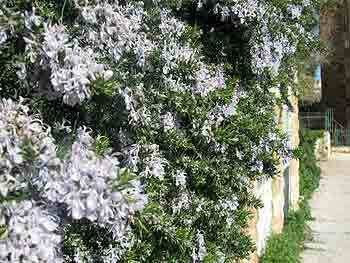 This hardy native bush appears in every public garden in Jerusalem, on every median strip, or any other spare patch of earth that the city would rather we didn’t trample on. So let's enjoy it! Not only does it taste fabulous when roasted with potatoes, it's one of the most popular healing plants. As a tea, it soothes indigestion. As a tincture it wards off headaches. It is also celebrated as the ultimate foe of head-lice. Should the natural adorableness of our well-tended children be insufficient to deter those little pests, a spritz of rosemary-infused oil on the hair each day should keep them away. This vigorous rosemary bush is in full bloom today. This native herb is prized throughout the world for its beneficial effects on women's health and for promoting healing after birth. It doesn't hurt men either, so feel free to add some sprigs to your next brew of tea. Freshly picked chickweed has a very pleasant flavor and is a nice addition to any salad. It won't add much to the size of your salad but my herbal healing teacher, Gadit Dvorkind, said it is potent for internal cleansing and preventing skin diseases, arthritis and other problems thought to be related to excess build-up of toxins in the body. Chickweed spotted thriving between the stairs leading to my front door. 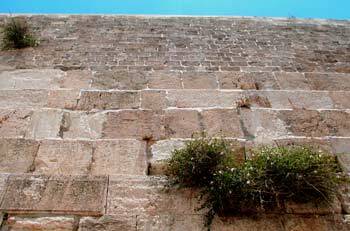 We have one of these growing in the wall above the door to our building’s bomb shelter, but I thought that this photo of a caper bush growing in the Western Wall was a more interesting sight. These capers, which seem cozily at home in Jerusalem-Stone wall cracks of any kind, are easily pickled in salt water and then enjoyed in many fancy French dishes, salads or on top of bagels & lox. According to Nissim Krispil, one of the foremost experts on the healing plants of Israel, capers have been used to treat open wounds, hearing loss and toothaches. 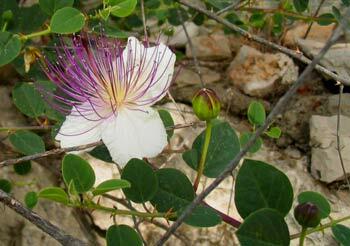 Caper bushes growing in the Western Wall. 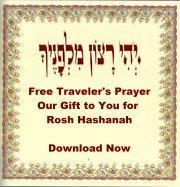 Do our prayerful tears give a head-start on the pickling process? This is only a tiny fraction of the useful and tasty plants of Israel I found today as I walked along our urban cul-de-sac. 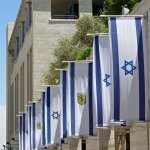 I haven't even tried these healing plants of Israel, yet I can feel their powers working already! Naomi Elbinger is a content marketer based in Jerusalem. She runs a boutique translation service specializing in historical translations, Yiddish-Translation.com, and blogs about business and marketing with a soul at MyParnasa.com. Disclaimer: The author of this article is not a medical professional. Please consult a doctor if you suffer from any symptoms requiring medical attention. Photo credits: Mustard, mallow, chickweed and rosemary on wall by Naomi Elbinger. 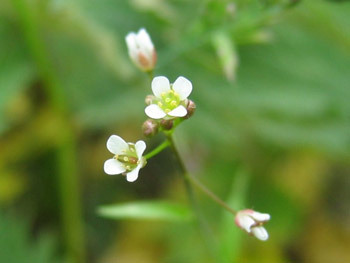 Rosemary blossom by Thor; shepherd's purse flower by Kristian Peters; shepherd's purse stalk by H. Zell, all under a cc-by-3.0-sa license.